Another Tesla Model S has crashed into a fully stopped Fire Truck at full speed, similar to an accident in January. 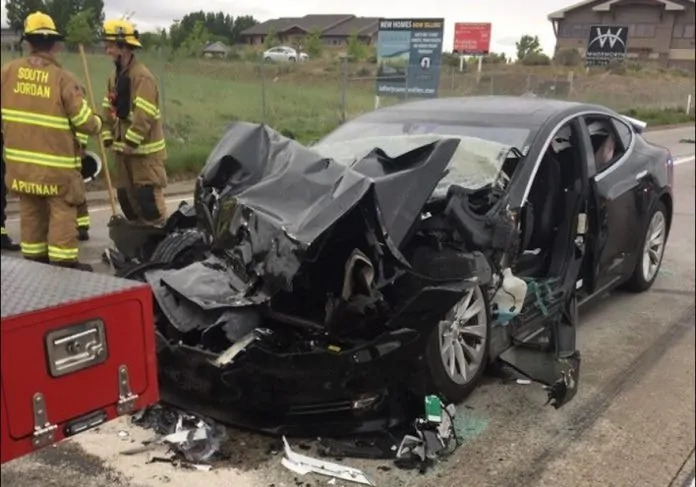 In this case, a Model S equipped with Autopilot 1.0, rear-ended a Fire Department mechanic truck stopped at a red light in South Jordan, Utah. According to witnesses, the Model S did not attempt to brake and the vehicle suffered severe front-end damage, resulting in airbag deployment and causing the driver to suffer a broken right ankle. The car was traveling 60 mph upon impact. It’s not immediately clear if Autopilot was active at the time, but it seems suspiciously familiar to a similar crash that occurred in January on the 405 near Los Angeles where a Model S traveling at 65 mph crashed into a stationary Fire Truck parked on the freeway shoulder assisting another vehicle. That said, these types of stationary objects and scenarios are something fully autonomous vehicles should readily handle and Tesla has continually promised that “Full Self-Driving” functionality for Tesla cars is coming soon, despite several delays and push-backs. Given that Tesla’s Autopilot system isn’t able to handle such seemingly straightforward scenarios, including recent fatal crash of an Autopilot 2.0 Model X into a concrete freeway barrier on Highway 101 in Mountain View, it seems we’re a long ways off from “Full Self-Driving” capabilities and Tesla drivers should use extreme caution when using the current Enhanced Autopilot feature.